The Happy Chocolatier™ was founded in 2011 with the mission of spreading chocolate happiness. 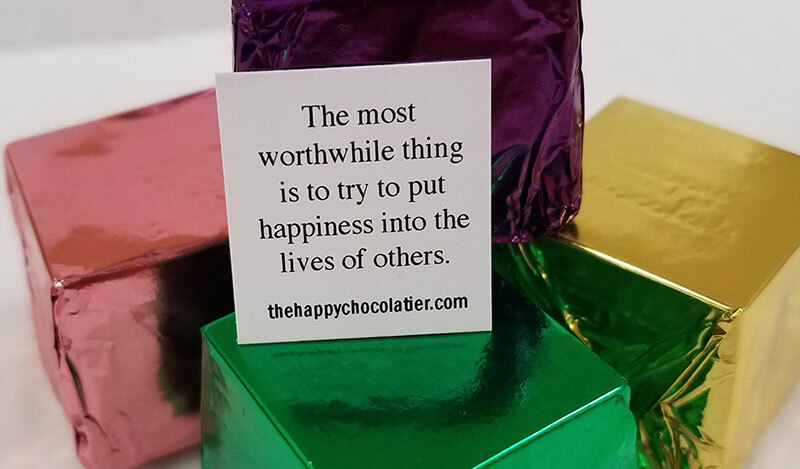 The Happy Chocolatier Cubze offer consumers a rich all-natural chocolate, plus a bit of happiness wisdom for a truly unique experience. The truffle Cubze are really two treats in one: they please the palate and enrich the soul. The Cubze are made with high-quality ingredients and are available in a delicious variety of flavors including cappuccino, chocolate, cookies & cream, cranberry, mint, peanut butter, raspberry and sea salt, coated in either milk or dark chocolate. People can enjoy a single piece or share the happiness by giving Cubze as a gift. The Happy Chocolatier has become known for its inspirational happiness statements. Customers frequently share stories of how the happiness sentiments were an added treat, or how they kept them for future inspiration by taping them to phones, desks and refrigerator doors.